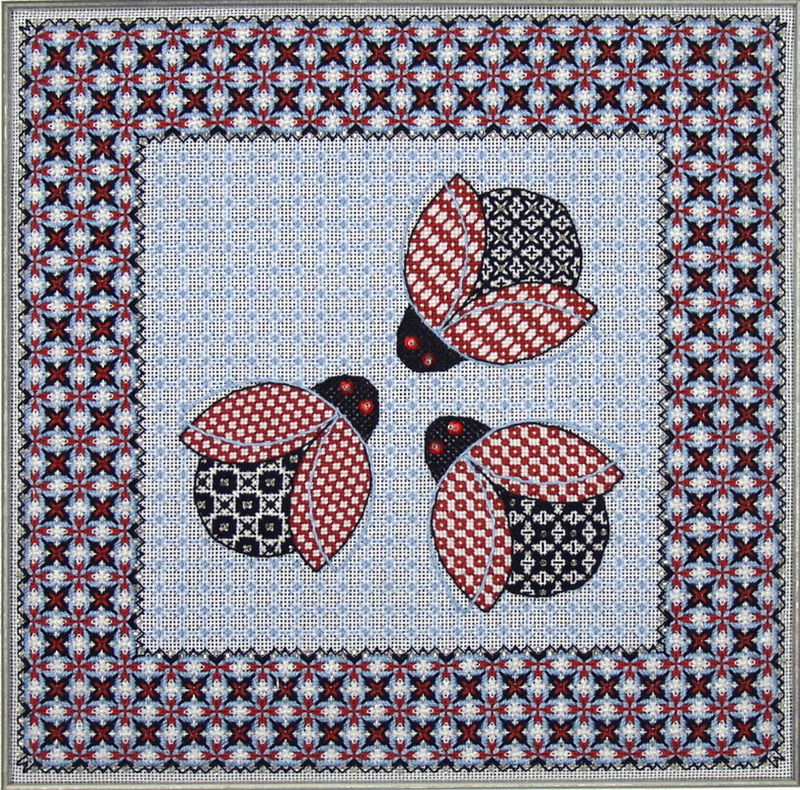 This flurry of flying ladybugs was inspired by an embroidered sweater. The basic shape of these insects was transformed into a perfect mirrored outline by using a folded paper pattern to poke an outline on to a piece of scrap canvas. Then three of these whimsical bugs were arranged on a diagonal axis and a charted outline was developed that enables them to have the desired symmetry. The main pattern elements are in the bug wings and bodies, and special diaper patterns were developed for these main focal points. The small scale Tent stitch patterns in the wings are executed in simple red and white pearl cotton with accents of white opalescent metallic in two of the patterns. The bodies each have large scale texture stitch diapers in black velour, black pearl cotton, and silver and black metallics. Some silver beads embellish these patterns as well. The wing patterns are solid but the body patterns are slightly open. The heads of the bugs are executed in a Web variation (a couching treatment) and the eyes of the bugs are indicated with applied red crystal flower shapes that are attached with silver beads. The beaded border pattern is a striking composite pattern with nine separate steps. The pattern is actually a bold diaper pattern that incorporates all the colors used in the interior areas. The main framework of Four-Way Extended Chevron units forms an open arrangement of what appears to be overlapping or interlocking circles. 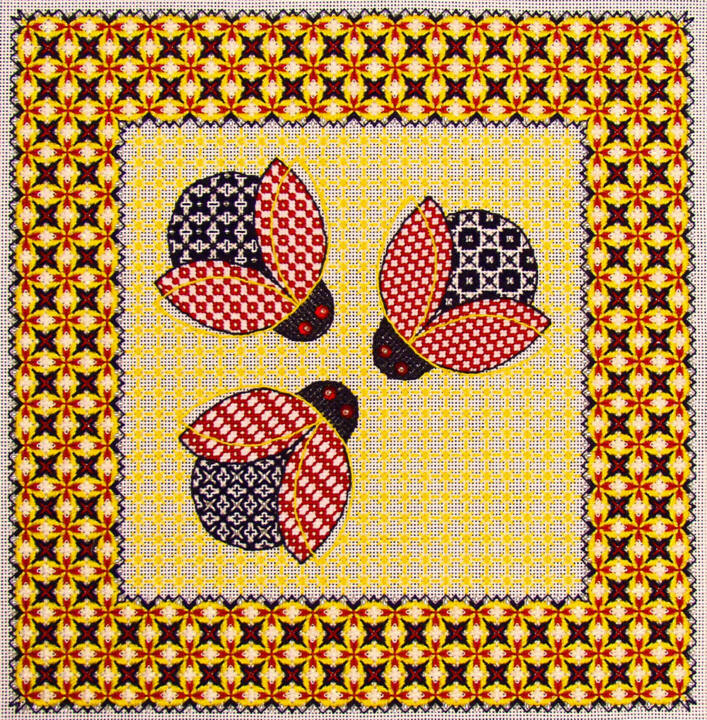 The open background pattern was developed to fit the border. It is composed of scattered Tied Double Crosses in a light blue pearl cotton with running stitches between the units in both directions that are executed in three strands of a slightly darker blue floss. The lattice effect created makes the pattern appear to be laidwork, but this is only simulated. The soft faded look achieved is an ideal foil to the brighter elements in the border and center motifs.